Derry City manager Kenny Shiels believes the days of signing experienced players from the Irish League are numbered. Brandywell boss, Kenny Shiels, believes the days of signing experienced players from the Irish League are numbered. 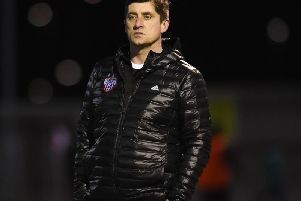 In fact, Shiels now holds the view that the full-time approach adopted by the ‘Candy Stripes’ is putting off the part-time players in the Irish League, who also hold down full time jobs, however he does concede that young players with potential will always look towards Derry City. With the transfer window opening in a few weeks time, Shiels says he may have to go Europe to bring in new faces. One man who Shiels is believed to be tracking is Glenavon defender Aaron Canning, but the price tag which the Lurgan ‘Blues’ have placed on the ex-Coleraine man may well end Derry’s interest. “There is a lot of movement in terms of endeavouring to get people in, but I can’t get one player from the Irish League,” confirmed the Derry boss. “I simply cannot get anyone from the Irish League because they are too expensive and I can understand why there’s very little trading takes place between the leagues. “Irish League players are clearly content receiving two wages per week and I’m not faulting them for that. However, it means that it’s a closed shop for us. “Finn Harps are experiencing the same problems as are Sligo Rovers. “So the only type of player we can attract, and it’s indicative of our squad, is the young lads of 19 or 20 who see an opportunity to move to the professional game and we are the only full-time club in Northern Ireland. “In fact, if you look at the current age balance in our squad, that’s certainly been the case,” noted Shiels.